Prof. Lynn Christenson of the Environmental Studies program and Keri VanCamp of the Collins Field Station are interested in using the drone to acquire various types of imaging of the Vassar Farm and Ecological Preserve. One area of focus is the beaver pond, which they’d like to view from above at different times of the year and over the years. After several unsuccessful attempts, we were able to collect a series of 200 images and stitch them together into the following visualization. In January, ACS was asked to create an aerial photo of the Greenway site. This is an area in the college’s Ecological Preserve that was originally created as a composting area, but over time had become a dumping site. While the college has begun to clean it up, some interested students wanted to document the clean-up over time. We were able to create this image, comprised of 57 individual photos. While we were pleased with that result, we were surprised to realize that the photo-stitching software that we used— Pix4Dmapper Pro— also created a 3D visualization of the site, which you can see at this website (click on “3D.”). Prezi is a tool for creating presentations, just as Powerpoint and Keynote are, but with some interesting differences. 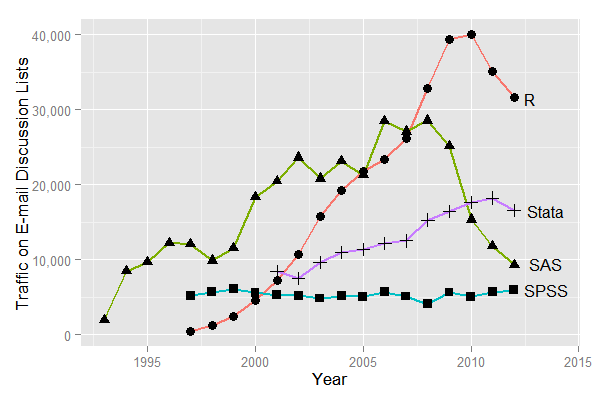 Since its creation in 2009, it’s been seen more and more in conferences. One way in which Prezi differs from earlier presentation tools is its metaphor. Both Powerpoint and Keynote use the metaphor of a series of individual slides that can be shown in a predetermined sequence, just as 35mm slides would be shown with a carousel projector. In Prezi’s metaphor, the creator arranges materials on an infinitely large canvas and— as I think of it— uses a video camera to pan and zoom through those materials. That can be done on the fly or the creator can pre-record a series of pans and zooms. The resulting presentation maintains the spatial relationships among the various materials. Although they can be downloaded, “Prezis” are assembled on the web, through your browser, and can be presented via your browser as well. They can be shared with the general public or with a select group of colleagues (or members of a class.) You can even collaborate with others on the creation of your Prezi, which makes it a great vehicle for group projects. I’ve seen great uses of Prezi and uses that make no sense at all— unfortunately, quite a few of the latter. If your presentation materials consist of a series of bullet-point lists, quotations, graphics, etc. that have no particular spatial relationship to each other, then there’s no particular reason to lay them out side by side and pan from one to another. But if there are spatial relationships— such as in a complex chart, diagram or map— then Prezi may be the perfect tool. Here are a few examples of great uses for Prezi. 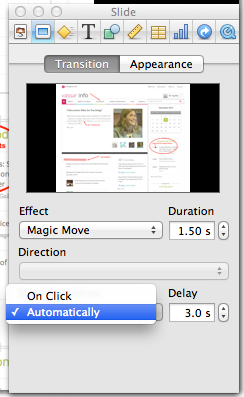 You can pan and zoom on your own, or click the Play button to step through a pre-recorded tour. 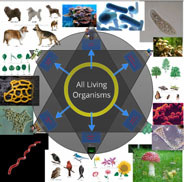 “Classification of Organisms,” created by Robert Kappus, will lead you systematically through a complex chart. The chart is circular, and the zoomed-in labels and graphics are aligned along radii of the circle, but that poses no problem, as the pre-recorded tour can not only pan and zoom, but rotate the view as well. 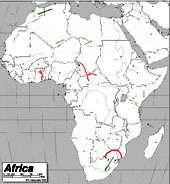 The “Physical Features of Africa Quiz” Prezi, created by Emily Thompson, will give you a tour through the major mountain ranges of Africa. Maps tend to be difficult things to project in a classroom, because the amount of detail means that labels often are too small to see from a distance. Prezi is a great vehicle for showing detailed maps, because of the extreme levels of zooming it can support. One of my favorite uses of Prezi is to explore different details of a complex work of art. 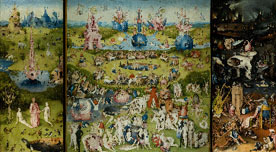 Here’s one that I created, providing a tour through some of the details of the painting Garden of Earthly Delights, by Hieronymus Bosch. An instructor can present a series of details from a work like this, without losing the context of each detail. A number of people have realized that Prezi can be a good tool for creating a concept map— a diagram that shows relationships among various concepts. 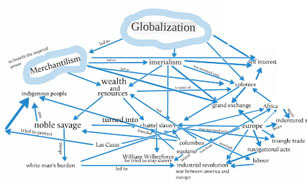 Here’s an example of a Globalization concept map, created by Dennis Carnduff. Go to the Prezi website to explore other materials that various people have made public, to get more ideas on how it can be used. Public, which is free, provides you with 100 MB of storage, but requires you to make your creations public. Enjoy, which costs $59/year, provides 500 MB storage and allows you to make your creations private. Pro, which costs $159/year, provides 2GB storage. However, students and teachers— anyone with an “edu” email address— can get the Enjoy level of license for free. The website also provides a gateway to “Prezi U,” a community of educators who share ideas about using Prezi in their teaching. Certain software programs tend to dominate the conversation at times, leading most to fall in line because of their pervasive nature. No software has held court so long as Powerpoint, the industry standard when it comes to creating a presentation. The software’s format and interface so easily combined our conceptions of word processing and the analog nature of the 35mm slide, that no other choice seemed to make sense. This ubiquity, though, is not without problems. With the desire to integrate various forms of media growing, Microsoft has tended to be a bit slow in their response. I picture all of those who want to integrate web-based video into their presentation, but are constantly reminded that it can only be done on the PC version of the software. Then there is the draconian method for developing movement within a slide (how many steps will that take?) and the horrible templates they provide for the slides. My blood begins to boil every time I attend a conference and see bullets. Now we shouldn’t demonize Powerpoint in such a way. It is just a tool, and one that has served us well throughout its life. But what alternatives are out there? Is there anything? One dilemma that I’ve seen boil up in the last several years has focused on a conversation that pits Keynote vs. Powerpoint. Apple’s version of a presentation software provides a much more flexible framework for developing material. The main benefit of Keynote is its ease of use. 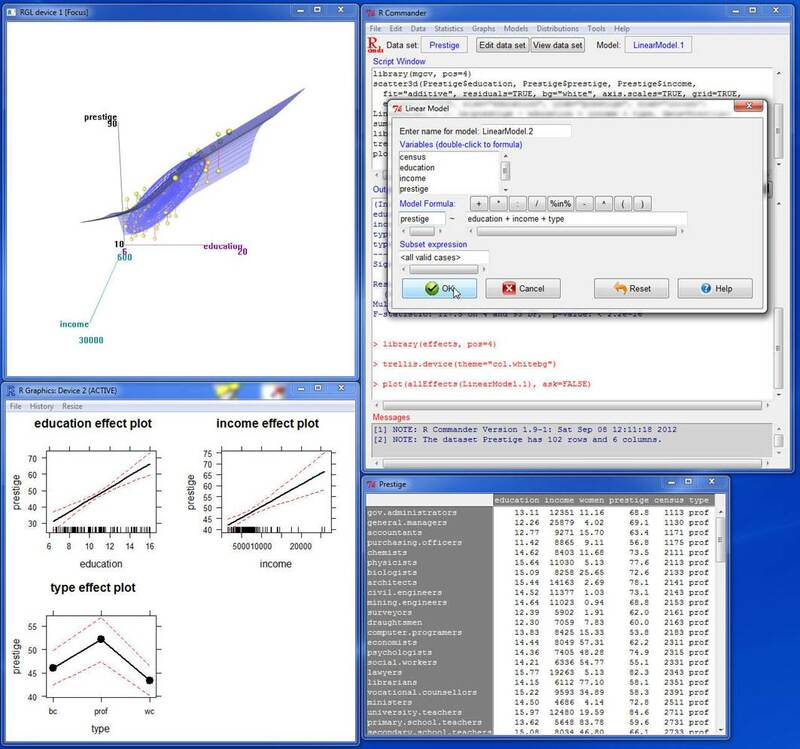 All or most of the functionality of the software is readily accessible and not hidden within a series of menus. It provides a variety of ways for getting media into a slide and it allows you to manipulate that information in a multitude of ways. From easily creating animated movements that direct attention across a single slide to the ability to mask certain parts of an image, Keynote’s adaptivity is an expression of what Apple is known so well for producing. 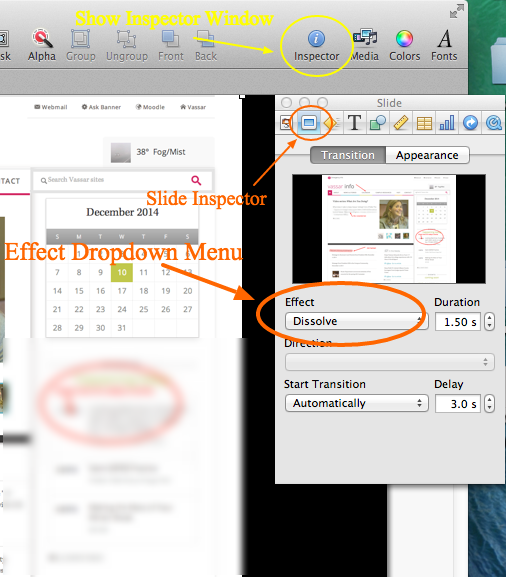 Beyond this, the software easily translates a Powerpoint file directly into Keynote and works in pixels instead of inches, which is a positive for those working with images. 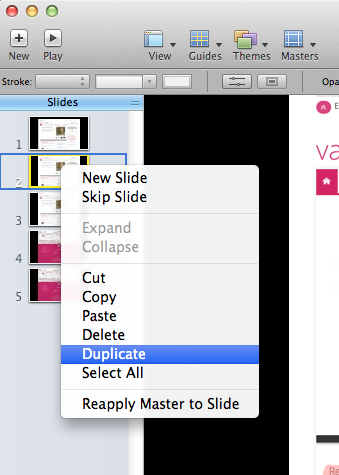 If you are a Mac user, you have in Keynote an alternative to Powerpoint. The question resides in how motivated you are to make a transition from the one standard to another. Here is a video that describes how to create an animation in Keynote. So, you now have to make a decision. Do you stay with the standard or delve into something new? I say give these other alternatives a try. Know about them and how you might be able to use them to your advantage. Though with the changes that have been taking place in this area, I’m sure there will definitely be something new just around the corner. Over the years, many Vassar faculty members have asked how to get a copy of Adobe PhotoShop®, an expensive program used by professional graphic artists for creating and editing digital images. Typically they’re not looking for sophisticated, complicated functions, though— just some basic things like re-sizing, cropping, and adjusting the brightness or contrast. 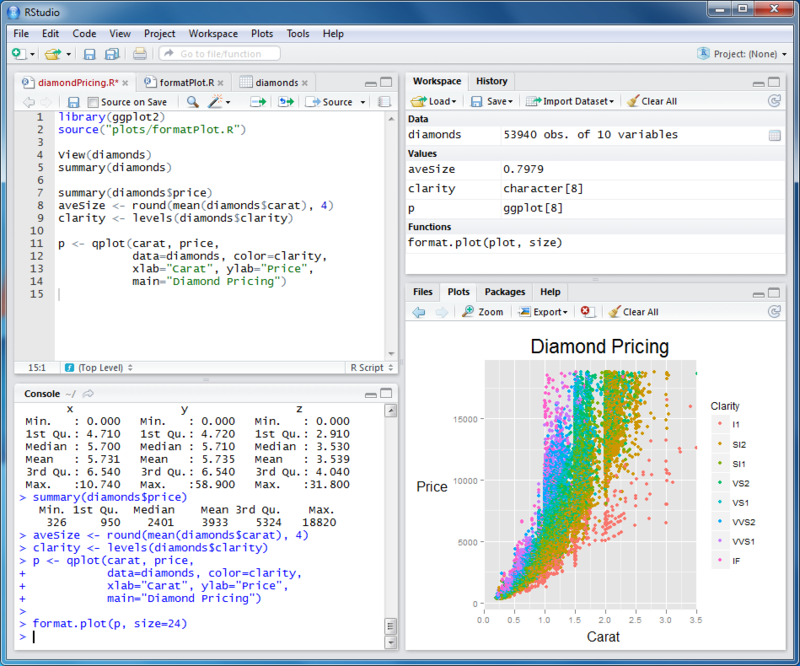 Though there are some free or cheap programs that can do these things, such programs are generally not easy to use. Now they— if they are Mac users, anyway— have a great alternative: Preview. Preview is a program that has been included with the Macintosh operating system for many years. By default, it’s the program that launches if you double-click on a JPEG file or PDF file. And initially, that’s about all it could do: show you what a file looks like. But over the years, it’s accrued more functions and the current version— the one that comes bundled with Mac OS 10.6— is an elegant tool for basic image editing. 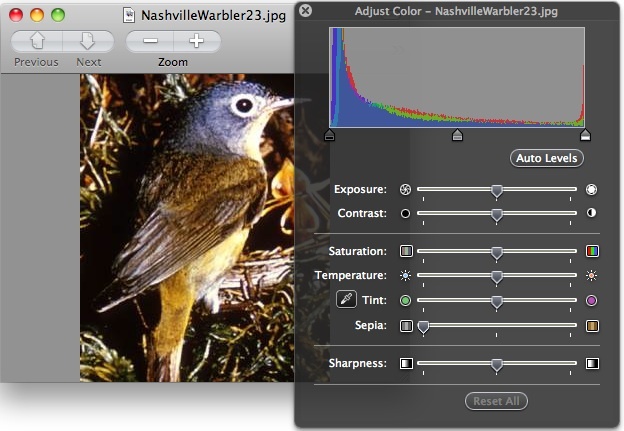 With the Color Adjustment tool, you can change the brightness, contrast, saturation, temperature, tint, sharpness, and even a sepia effect. The Size Adjustment tool is essentially the same as PhotoShop’s— you can adjust the height, width or resolution, choosing whether to resample the image when doing so or not. 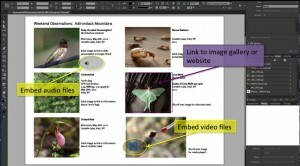 You can use your mouse to select a portion of the image and crop the rest out. You can rotate or flip the image. You can copy and paste pieces of the image. When you’re done, you can save the edited version in any of several file formats. And while this is not new, it’s a nifty capability: you can drag a collection of image files onto the Preview icon to present a slide show. 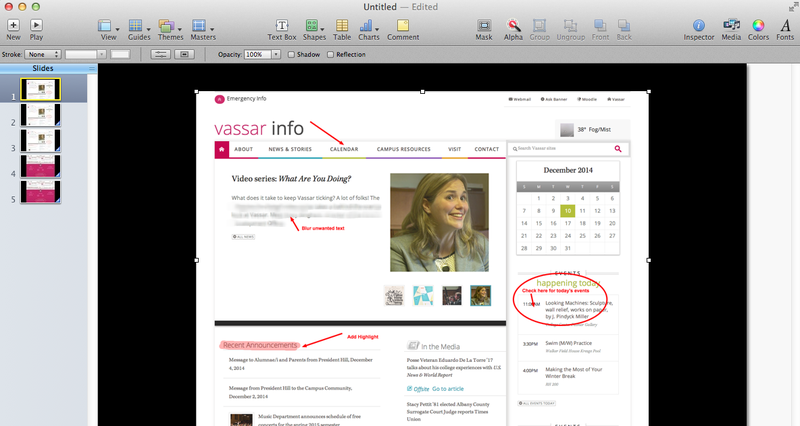 Preview can also display PDF files— in fact, it’s the default PDF viewer on a Macintosh. What’s new is that you can now use Preview to annotate a PDF in various ways. You can drag a circular or rectangular shape around something on your page or make an arrow pointing to it; you can choose the color and line thickness for this. You can create a text box and type a comment wherever you like; you can choose the font, size and color of your text. For longer comments, or ones you don’t want to clutter up the page too much, you can embed a link to a note that will pop up in the margin— ideal for commenting on student papers submitted as PDFs. If your PDF was created from a text file (i.e., not simply a scanned image of a text page), you can select a portion of the text and highlight it, underline it, “strikethrough” it, or embed a web link into it. You can also insert a bookmark into a specific spot and name it; all your bookmarks for that document will be listed in the Bookmark menu. After being saved and shared, all these mark-ups will be viewable by people using PDF viewers other than Preview, such as Acrobat Reader®. You can’t get a copy of Preview all by itself; it comes bundled with the operating system. 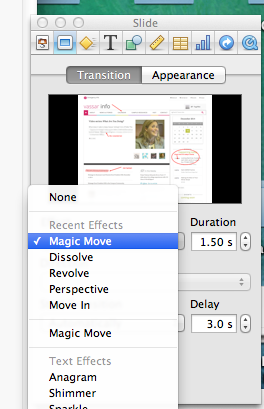 If you don’t see all these functions in your Preview, you may not have the current version. For more details about these and other functions, click on the Help menu within Preview.